The “Information Centre” located under the “Field of Stelae” complements the abstract form of remembrance imparted by the memorial by providing information about the Holocaust. The exhibition focuses on personalizing the victims and on the geographical dimension of the Holocaust; these central elements come across as the main theme throughout all of the Information Centre. The permanent exhibition gives the victims names and faces; it depicts the fates of individuals and their families, their life, suffering and death. The exhibition is made up out of four thematic rooms. The path to the first room leads through foyers 1 and 2. The visitor can get basic information here about the historical context of the 1933-1945 time period. Six faces in large format look out at the visitors from the foyer’s opposite wall upon entering. These portraits represent the six million Jewish victims of the Holocaust. Each image stands for a specific gender and age group: men and women, children, adults and the elderly. Room of Dimensions – This room demonstrates the European dimension of the mass murder of Jews; with the letters and personal memories of individual people set on lit up tiles and with a running band showing the number of victims in European countries. Room of Families – The fates of 15 Jewish families are used as examples of the fates of families before, during and after the Holocaust; they are presented on “uprooted” slabs which seem to grow out of the ceiling. Their social, national, cultural and religious lives are depicted here. 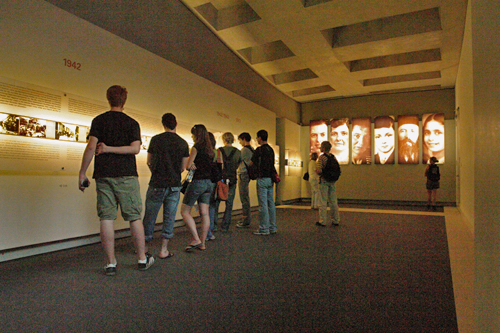 Room of Names – A presentation of the names of the victims; every name is individually projected onto the four walls of the empty room; while a voice reads out their biographies. Room of Sites – A mapped out overview of the sites of persecution and extermination in Europe. Through the use of serial short films, the wide slab sides depict the enormous number of places of persecution and killing as well as how they were connected with one another. The narrow slab sides use images and text to provide information about the largest extermination sites.